In Japan, there is a lovely tradition of celebrating whenever you meet an old friend for the first time in the new year. Of course, the first celebrations are with family and closest friends, but like ever-widening circles rippling across the surface of a pond, a succession of parties called shinnenkai or New Year’s gatherings continue throughout the month of January. This weekend I met up with friends at the Asian Studies Group for our annual shinnenkai at Sake Bar Yoramu. The ASG is a wonderful group that has added untold joy to my life in Kyoto. Comprised mainly of university professors, graduate students, and anyone else with a lively curiosity about Asian history, music, art, culture, religion and literature, the group sponsors monthly lectures that have taught me so much on all of these topics as well as many others. And given the propensity of this group to revel in the details of history and subtleties of philosophy, it’s no wonder that our annual shinnenkai would be a sake-tasting at Yoram’s Sake Bar. Halle O’Neil, a doctoral candidate from the University of Kansas, came dressed in her “Japanese Art Historians for Obama” t-shirt to celebrate that world-changing event taking place this week on the other side of the planet. As I was arriving, Reggie Pawle, a doctor of Buddhist psychology, was thoughtfully considering some point being made by Catherine Ludvik, a Buddhist art scholar from Toronto fluent in both sanskrit and Japanese and specialist in Benzaiten, the goddess of art and literature. Later in the evening, Reggie told me of a cosmology discussion group in Kyoto that he’d recently heard of. With so many colleges and universities in Kyoto, there are just countless groups and sub-groups focusing on so many different ways to stimulate the mind. But for this evening’s party, the agenda was not cosmology but the enjoyment of sake — good sake, sake with a robust range of flavors. And for that purpose, Sake Bar Yoramu is the best place to be. A delightful little vest-pocket bar with limited seating, half the length of the narrow room is taken up by the glorious stepping stone entryway shown in the top photo. 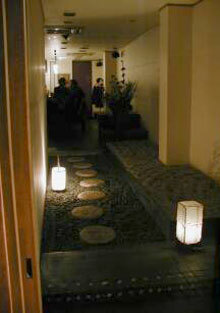 This pathway leads you back to Yoram himself and a seat at his bar. An Israeli ex-pat, Yoram is a long-term Kyoto resident and has had this sake bar for the past decade. Sake is essentially a simple beverage made from rice, water, yeast and koji bacteria — four ingredients and a world of flavors. Or at least it could be, if sake brewing weren’t controlled by a handful of large breweries that have filtered, blended, pasteurized and stifled it into a bland standardized and flavorless alcoholic drink. I was never a great fan of the stuff, until I met Yoram. An expert in the family-run microbreweries of Japan, Yoram has carefully selected each sake he serves for its distinctive character and can recount the details that not only make it different from each other sake but also very different from anything you’ve tried before. In previous years, I’ve sampled a wonderful lemon-y flavored sake brewed by a recipe dating back to the Kamakura period (~1200 AD) and milky white nigori sake that still contains bits of the rice it was brewed from. This night’s tasting started with a genmai (brown rice) sake made in Saitama (near Tokyo). And to complement the sake, we were served a plate with bite-sized pats of cream cheese drizzled with a mix of soy sauce and wasabi, top right. This was definitely non-traditional, but definitely a taste treat. This was followed by an unpasteurized, undiluted, somewhat sweeter, full-bodied brew from Shiga, the prefecture next to Kyoto. And accompanied by roasted green peppers (fourth picture down). And then we had Karadahanke, a slightly sour, slightly acidic sake from Chiba (also near Tokyo). This was a natural yeast sake brewed by a multi-stage process, served with nanohana, a green vegetable popular in Japan, flavored with sesame seeds. (second picture from the top). For our fourth taste treat, we had a slightly sweeter sake accompanied by the most interesting dish of the night (shown as the middle image). A salad of shredded daikon with a rice vinegar dressing topped by salt-preserved cherry blossoms. Simple but amazingly elegant in its presentation and equally amazing to taste. And then the night was capped by a 10-year-old sake that just rolled across the palate, accompanied by steaming bowls of “wafu risotto”. Yoram’s own recipe for a hearty Japanese-flavored risotto with mushrooms. Can mere words ever do justice to such a multi-sensory experience? But perhaps the best part of the evening was the way our normally staid and erudite academic group turned into a bubbly, chatty and slightly giggly group of friends renewing our friendships for 2009. Once again I’ve had a lovely and langourous start to 2009, enjoying many of the Japanese rituals for welcoming each new year. Several were documented in my posts last year, but one that seemed to need particular attention this year is the Toka Ebisu festival on January 10th. Ebisu is one of the seven lucky spirits, popular in northeast Asian mythology. Each of these seven deities represents a particular virtue and is the patron of one or more occupations. Traditionally, Ebisu was associated with the sea, sailors and fisherman, but became the patron of commerce and business during the Edo period. On the 10th day of the New Year, Kyotoites flock to the Ebisu shrine at Kenninji to say a prayer for good business in the coming year. 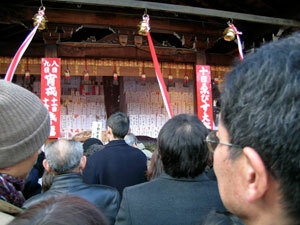 This year, the shrine was filled to capacity with long lines of people waiting to say prayers for a more prosperous 2009. A limited sense of how crowded it was may be seen in the photo above, although you won’t quite feel the jostling of actually being in the midst of the throng. 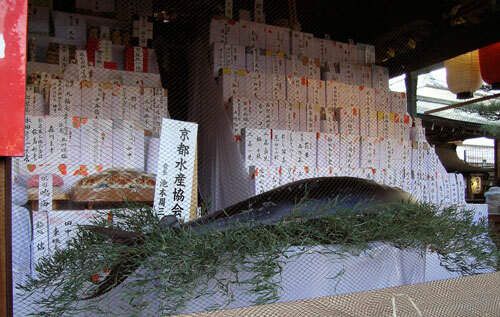 The altar was laid with a giant tuna and behind the altar, bottles of sake line the shelves. The crowds wait patiently as each individual takes their turn in ringing the altar bell loudly to attract Ebisu’s attention before saying their prayers and tossing a few coins into the collection bin. 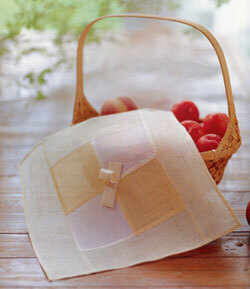 But of course, no shrine pilgrimage would be complete without purchasing an omomori to carry home. 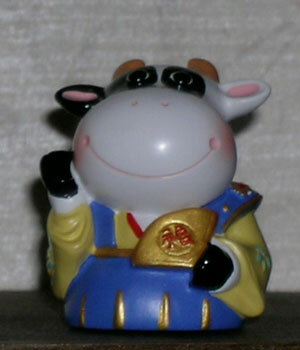 Although loosely translated as “good luck charm”, omomori actually function as a surrogate-self or double. When there is danger, illness, bankruptcy or other problems in the air, these nasties are attracted to the brightly colored omamori rather than to the individual or in this case, their business. For that reason, the omomori is returned to the shrine the following year, so that omomori and all of the problems it has absorbed during the year can be ritually destroyed. Then of course, a new omomori must be purchased for the coming year. The circular bamboo platter shown at top is decorated with images of both Ebisu and Daikokuten, the patron of farmers, as well as fish, rice, gold and a crane for longevity. The red mobiles shown next represent crowds of customers flocking to your business. And then, for those who prefer a customized “charm”, there is a veritable smorgasbord of items to select from. These are attached to a bamboo frond that has been blessed by the dancing shrine maidens shown below. Of course, all of these luck charms carry fees that range from a few dollars to a few hundred dollars. If the luck can be purchased, you would already have to be fairly lucky to afford some of the larger omomori. 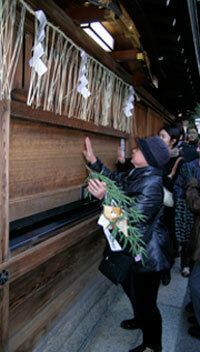 The final ritual before leaving the shrine is to pound the wooden wall along the back route out of the shrine. Ebisu is a prosperous old fellow and variously thought to have grown a bit deaf in his old age, a bit lazy with his success or a bit drunk on his many bottles of sake. Either way, Kyotoites believe it’s necessary to wake up old Ebisu and remind him of their prayers one more time before leaving. And this year the wall rattled thunderously as many hands gave the wall repeated and resounding thuds to wake old Ebisu up. May 2009 be a better year, bringing prosperity and good fortune to us all. 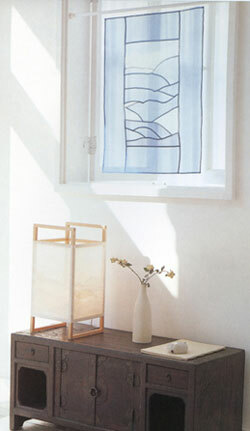 This entry was posted in holidays, Kyoto living on January 12, 2009 by admin. 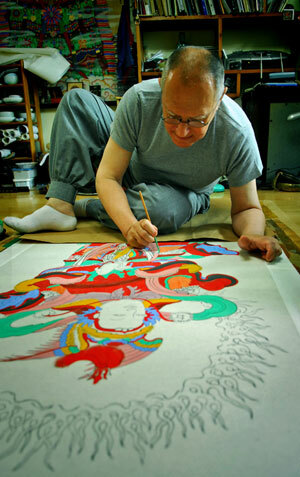 On Sunday, the second day of our trip, we went to the studio of Brian Barry, a Buddhist Temple painter. I must admit that with all of the walking we had done the day before, my feet were still hurting all the way up to my bellybutton. So I was grateful that we hopped into a taxi for the journey across Seoul to Brian’s home and studio. It was a glorious fall day and the trees were flaunting their most perfect colors for us as we drove along the winding roads through some of the wealthiest and most scenic residential areas of northern Seoul. 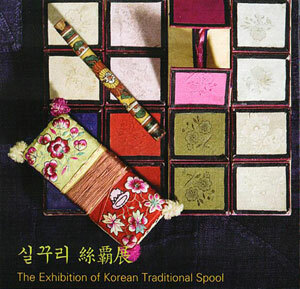 It’s thought that Seoul’s earliest settlement may have been as long as 6,000 years ago and the geomancy of the mountains that ring the city were considered auspicious by the Chosun dynasty rulers, who chose the site as their capital. Modern Seoul has become home to over 10 million people, forcing an urban spread up the slopes of those surrounding mountains. Despite differences in the architecture and signs in a language I couldn’t read, the topography of our route reminded me of driving through parts of Marin county in California. Brian’s studio is on the third floor of an apartment building nestled against a hillside that has been designated a national park. Thus on the one side he faces the immediate glories of the natural world and on the other the great urban sprawl, a perfect perch from which to reflect on cosmology in the modern world. 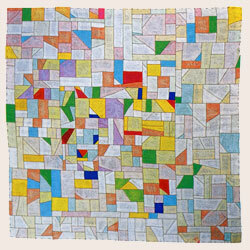 Initially, Brian came to Korea with the Peace Corps. In 1967, he was assigned to public health work, fighting TB in an underdeveloped country still reeling from the devastation of the Korean Civil war. 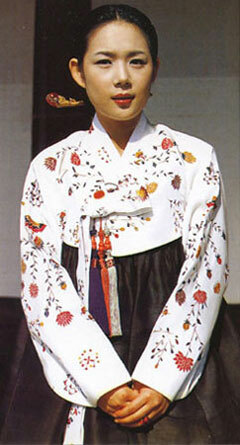 As his love for the Korean people and culture grew, he stayed to study Buddhism, supporting himself as an interpreter. And decades later, one of those interpreting jobs for an American architect led him to focus on dancheong (colorful cosmic design patterns) painted on Korean temples. 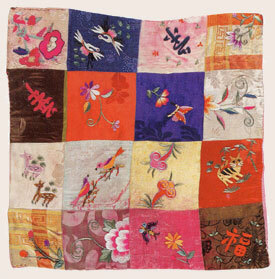 Thereafter, Brian sought out Master Manbong (1910-2006), a dancheong specialist who had been designated transmitter of Important Intangible Cultural Property No. 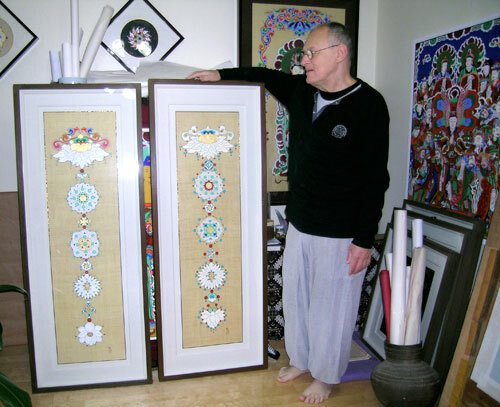 48 of Korea, and then to this master artist, Brian expressed his ardent desire to learn Buddhist painting. Although Master Manbong accepted this strange blue-eyed foreigner as one of his students, there was much doubt that a foreigner would ever be able to endure the hardships of the training regimen to learn the intricate skills of temple painting. Indeed, learning Buddhist painting proved to be extremely demanding, but Brian stuck it out for more than 20 years, continuing to learn from and serve Master Manbong until the Master’s death in 2006. And to glimpse the world of dancheong that has so inspired Brian Barry for 20 years, I offer below a small collection of images from Buddhist temples in Korea. Who could fail to be inspired by dancheong? I can foresee that even my humble sewing projects will have a future influence reflected in shades of teal and turquoise, richly punctuated by coral, gold and navy. This entry was posted in Korea on November 22, 2008 by admin. Last weekend I managed a brief getaway with three of my friends: Wendy Carroll from Australia, Kazuko Horiuchi from Chile and Judith Clancy, who was once upon a time from New Jersey. And our trip was indeed a delight. We flew off for a weekend in Seoul, South Korea. Although I had been to the Korean port city of Pusan many many long years ago, I wasn’t really prepared for the melange of flavors and textures that greeted us on our arrival. 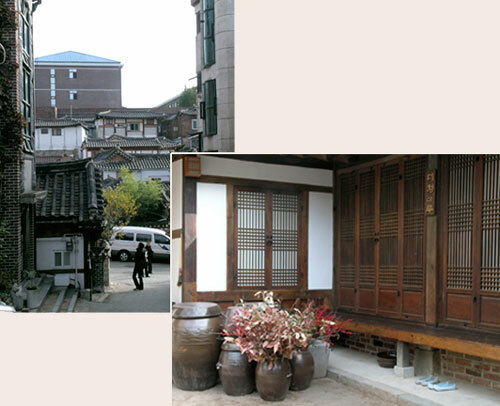 We stayed at a traditional Korean inn called the Tea Guest House in the neighborhood of Insadong, which was a mix of traditional and modern buildings as shown by the images below. It was only an hour and a half flight from Osaka to Seoul, but there was a two-hour trip from Kyoto to the airport early in the day and a two-hour bus-ride from the airport in Seoul to our guest house in Insadong. So we were a pretty weary group of travelers by the time we checked into our lodgings. But we quickly found our way down the street to celebrate our arrival with a feast of Korean sea food at a restaurant that had been recommended by one of Judith’s many friends. 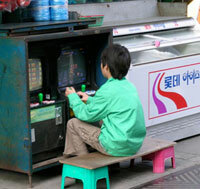 Seoul boasts of having the world’s best Wi-fi access and broadband connections with mind-boggling download speeds ranging up to 100Mbps, so it was amusing to see this young boy playing street-side video games in front of the local grocery store as we scouted out the city the next morning. 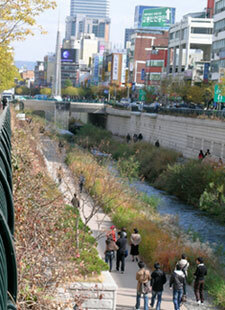 In the center of Seoul, there’s a branch of the Han River that had been paved over during the rush to modernize. But with the 21st century preference for green cities, a major reclamation project was initiated to tear down the elevated freeway and restore river as a sunken riverside park for city residents to enjoy. We spent most of Saturday walking around Dongdaemun Market, one of the major shopping areas in Seoul. When we set out in the morning, we blithely started off to the gold district to buy earrings…and arrived to find block after block after block lined with stores selling every manner of gold adornment. And though we could have easily spent the day there playing with gold till our heart’s content, we decided to press on deeper into the heart of Seoul’s shopping district. Or rather I should say, one of Seoul’s shopping districts. 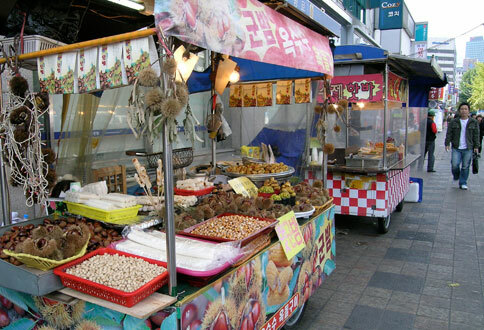 We never made it to Namdaemun Market, Seoul’s other older shopping district. We walked for hours. There was a lamp district, where all the stores sold lighting, and a plastics section, where you could buy anything made of plastic. Sheet metal fabrication shops were clustered in another area we walked through. An area that seemed to sell only towels for blocks and blocks. And bedding covered another area. For lunch, we finally stopped to eat at one of the food vending stalls that line the edges of the street. And again, the variety was enormous. The stall in the foreground offered chestnuts: roasted, candied and batter fried. Other stalls offered noodles, tempura or sausages. Still other stands sold bags of traditional sweets made from puffed grains and/or nuts sweetened by honey. These were so reminiscent of granola that we wondered if Korea had provided the original inspiration when that cereal was introduced to America in the 1960s. 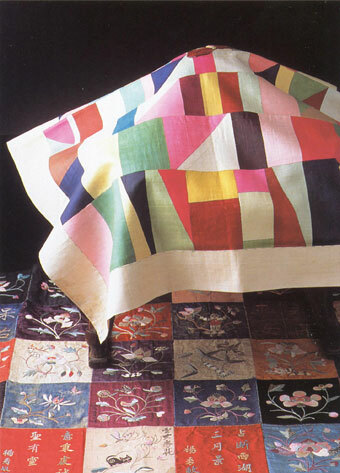 Then finally we came to crafts and fabric. Was I in heaven? When there was lace, there was lace galore. 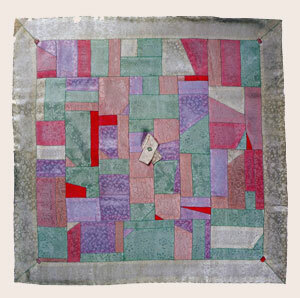 And ditto with yarns and buttons and ribbons and tassels. Each bit of craft had it’s own area with more choices than I could possible sort through or savor over if I’d had a month of Sundays. All in all, Dongdaemun Market is comprised of 20 shopping malls (with fashion segmented by floors), 30,000 stores, and around 50,000 wholesalers. If you want it, they’ve got it. Sadly though, there was not enough time to drink it all in. We had barely found the embroidery section when it was time to go. The time allotted to our shopping spree was over. At least for the moment anyway. Having discovered that such delight is so close, I’m sure I’ll go back again. And that was only Saturday, but it is enough to fill one blog-post for tonight. I’ll have to write about Sunday later. This entry was posted in Korea on November 18, 2008 by admin. …there were a variety of games to play. And since my wonderful computerized electronic whizball of a sewing machine had to be sent off for a week in a sewing machine hospital, I was forced spend the weekend trying to remember what I did before that lovely electronic toy entered my life. Fortunately for me, there was a Genji exhibition at the Museum of Kyoto this week, celebrating the thousand year anniversary since The Tale of Genji was published by Lady Murasaki Shikibu, an 11th century aristocrat. Widely considered the world’s first novel, Genji is a classic of Japanese literature detailing courtly life in ancient Kyoto. 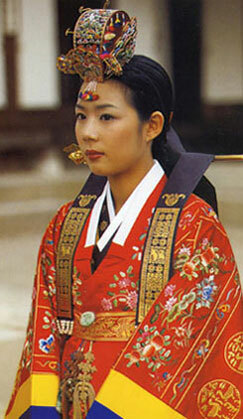 For ten centuries The Tale of Genji has been a source of inspiration for the Japanese arts. 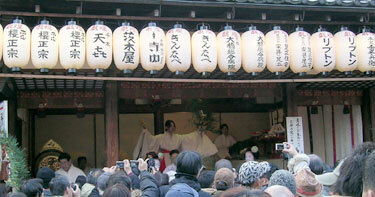 Bugaku dance and Noh performances have re-enacted the life of Prince Genji, while the games and pastimes described in the story were adapted and expanded to reflect the novel. 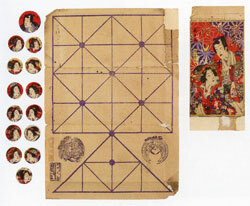 The playing pieces for the 19th century board game shown at right were painted to represent all the main characters from Genji. The center panel of the woodblock print above shows the same game being enjoyed by a cluster of noblewomen. 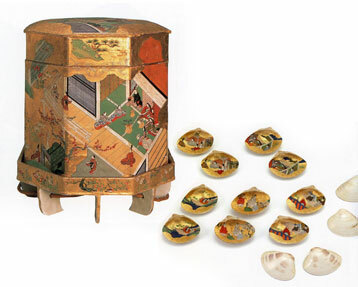 Likewise, the kaiawase clam shell matching game with its hexagonal storage box were delicately painted with scenes from the novel. 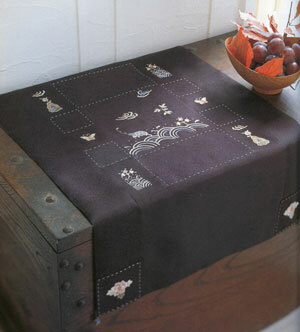 Kaiawase matching is an ancient game, but quite similar to the card game “concentration”. Pairs of cleaned and polished clam shells are painted with matching images, then multiple sets of clam shells are collected to form a complete game set. To play, the clam shells are placed painted side down and the players take turns trying to find and match the identical pairs. Though I’ve never had a chance to play the game itself, I’ve always been fascinated by the elaborately detailed imagery painted on the shells and storage cases. And of course, there is manga. Reading manga has always been one of the quintessential forms of Japanese entertainment. 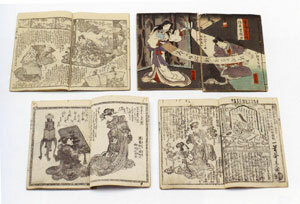 The books shown here are examples of a 19th century retelling of Genji. Never having been stigmatized as “mind-rot”, the way western comic books have been, manga have always enjoyed an appreciative audience in Japan. In an earlier time, they were simply called e-hon (picture books) and attracted some of the brightest artistic stars of the day. There were, of course, vastly more games on display in the exhibition, involving skills as diverse as incense sniffing and poetry reciting — far too many of course for a simple blog entry to recount. But it seemed as though in a simpler world, the goal was to find ways to delight each of the senses rather than just to kill time. 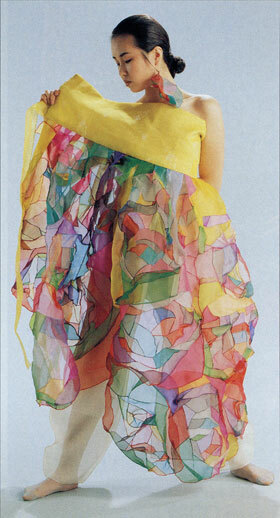 This entry was posted in Kyoto living on November 4, 2008 by admin.